Arambol beach of Goa is one of those beaches that is less frequented by visitors as compared to other popular beaches. 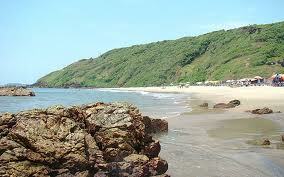 Its secluded location in the north of Goa makes it untouched and unspoilt. Though it is not thronged by crowds, the Arambol beach is visited often by tourists who look for tranquility and peace and a dreamy place such as the beach to relax. The Arambol beach of India also has sulphur springs that have medicinal properties and freshwater lakes where one can swim.